Join Us!!! We are looking for someone to help us cover Vincentian basketball. Please send us an e-mail. When the final whistles were blown last Friday on the 2016 Secondary Schools' Basketball Tournament, the Petit Bordel Secondary and the Bequia Community High left the New Montrose Basketball facility in the highest spirits. 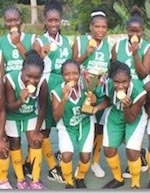 Petit Bordel completed their unbeaten run with a 43-33 win over the Bishop's College Kingstown in the female final. Leading in all quarters, Petit Bordel Secondary ran out 18-8, before Bishop's College pecked away to reduce the deficit in the second, 26-20. The margin was reduced yet again in the third quarter, but Petit Bordel still held out to lead 34-29. Bishop's College could not keep up their momentum developed through their second and third quarters, and had to bow to the stronger Petit Bordel. For the winners, player of the final Kannique Lewis netted 32 points. Gabriel Lewis had 12 for the Bishop's College Kingstown. Before reaching the final, Petit Bordel had doused the Girls' High School 71-8, while Bishop's College had downed West St George Secondary, 32-12. West St George went on to secure the third place, defeating the Girls' High School 44-6. The Girls' High School was adjudged the most disciplined team. Meanwhile, the Bequia Community High upstaged the 2015 winners, George Stephens Secondary, to emerge as the new male champions. Jordley Bynoe registered 25 points and Reon Ollivierre 18, to lead Bequia Community High to a comfortable triumph over the defending champions. The quarter scores read, 19-16, 49-18, 58-24 and eventually 77 - 34, all in the Bequia Community High's favour. Vivian Smart scored 12 points to lead George Stephens Secondary's tally. St Vincent Grammar School won Bequia Seventh Day Adventist 63 - 54 to take the third place, along with the honour of being named the most disciplined team in the male division. UMMC Ekaterinburg (PBL) signed 32-year old Spaniard-Vincentian center Sancho Lyttle (193-79kg-83, college: Houston, agency: 4PlayersSports). Lyttle managed to play in three leagues in two countries last year. She played last summer at Atlanta Dream (WNBA). In 24 games she had 10.3ppg, 8.3rpg, 2.2apg and 2.3spg. The last season she played at Galatasaray (Superleauge) in Turkish league. In 29 games she recorded 13.2ppg, 9.6rpg, 2.2apg and 2.1spg. She helped them to win the league title. A very impressive season as she was voted Eurobasket.com All-Turkish TKBL Bosman Player of the Year, Eurobasket.com All-Turkish TKBL Player of the Year and Center of the Year. Lyttle also played 13 games in Euroleague where she recorded 11.0ppg, 9.1rpg (#5 in the league), 1.9apg, 3.1spg (in top 2) and 1.0bpg. She contributed to her team making it to the quarterfinals. Quite impressive season as she was voted Eurobasket.com All-Euroleague Defensive Player of the Year and named to Honorable Mention. The list of the past achievements is quite long as among others Lyttle was voted Eurobasket.com All-Europeans Player of the Year in 2014. She represented Spain at the World Championships for Women in Turkey last year. Lyttle's team won Silver and her stats at that event were 6 games: Score-1 (18.2ppg), Reb-2 (11.5rpg), 2.8apg, Steals-1 (3.3spg), FGP: 52.9%, 3PT: 20.0%, FT: 72.7%. 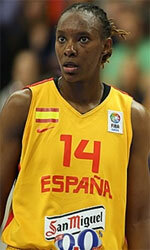 Lyttle has played previously professionally in WNBA (Houston C.) and Spain (Perfumerias Avenida, Ros Casares and Ibiza). She attended University of Houston until 2005 and it will be her eleventh (!!!) season as a professional player. Lyttle could be described: A dominant inside player who can end almost every game in double-double. She's also capable of some incredible, game-changing defensive plays. San Antonio Stars forward and 10-year WNBA veteran Sophia Young (6'1''-F-83, college: Baylor, agency: Bruce Levy Assoc.) will retire at the conclusion of the 2015 WNBA season, the team announced today. Young-Malcolm will end her career as the Stars all-time leader in games played, points, rebounds, steals, minutes, field goals made and free throws made. Young-Malcolm will be honored during a postgame ceremony, following the final home game of the season against fellow Baylor alum Brittney Griner (6'8''-C-90, college: Baylor, agency: Wasserman Media) and the Phoenix Mercury, on Saturday, Sept. 5. 'It's been 10 amazing years,' said Young-Malcolm. 'I'm blessed to be a part of the SS&E organization and to be here for my entire career. I'm so privileged, and I cannot thank the fans, my teammates and my coaches enough for the blessing to be where I am and to play this sport that I love. I'm very happy I get to retire at the place that I started.' A three-time WNBA All-Star, Young-Malcolm was named to the Stars All-Decade Team in 2012. She holds career averages of 14.4 points, 6.1 rebounds, 1.9 assists and 1.59 steals in 30.9 minutes over 295 games. She was named to the All-WNBA First Team in 2008 and the All-WNBA Second Team in 2007, 2009 and 2012. Her best season came in 2009 when she averaged 18.2 points, 6.5 rebounds, 1.6 assists and 1.33 steals in 33.7 minutes. Among Stars all-time leaders, Young-Malcolm ranks third in total assists (547) and third in points per game (14.4). On June 30 against the Phoenix Mercury, she became the 24th player in WNBA History to reach the 4,000 point plateau, scoring every one of them in a Stars uniform. 'Sophia has had an incredible WNBA career in San Antonio,' said Stars Head Coach and General Manager Dan Hughes. 'Her career is a success story of fulfilling dreams, on and off the court. We thank Sophia for what she has meant to the Stars organization and look forward to seeing what life has in store for her after basketball.' 'Sophia has been an integral part of the Stars success for the past decade,' said RC Buford, president of sports franchises for Spurs Sports & Entertainment. 'We admire her commitment to the organization and applaud her efforts in the San Antonio community. All of us at SS&E thank Sophia for her contributions and wish her the very best in retirement.' In WNBA history, Young-Malcolm ranks 17th in points per game (14.4), 18th in steals (468), 21st in field goals made (1,633), 22nd in free throws made (944), 23rd in total points (4,273), 23rd in minutes per game (30.9) and 25th in rebounds (1,786). Young-Malcolm has made the playoffs seven times in her career including in six straight seasons with the Stars from 2007 to 2012. She leads the Stars in field goals made (171), free throws made (113), rebounds (169) and steals (37) during the postseason. Additionally, she is tied for first in playoff games played (26), and ranks second in minutes played (886) and total points (456) in Stars playoff history. In 2008, Young-Malcolm helped lead the Stars to the only WNBA Finals appearance in franchise history. San Antonio finished the regular season with a franchise-best 24-10 record, earning the best record in the Western Conference. The Stars posted playoff series victories over the Sacramento Monarchs and the Los Angeles Sparks before falling to the Detroit Shock in the 2008 WNBA Finals. Young-Malcolm was originally selected by the Stars in the first round (fourth overall) of the 2006 WNBA Draft out of Baylor University. The 31-year-old spent four years with the Bears from 2002 to 2006 where she was a two-time All-American. In her junior season, she led the team to a National Championship victory over Michigan State in the NCAA Women's Tournament. During the 2015 season, Young-Malcolm is averaging 11.8 points, 5.3 rebounds, 1.4 assists and 1.19 steals in 27.3 minutes in 28 games.